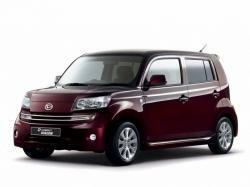 Correct Wheel Sizes, PCD, Offset, Rims and Tire specs for Daihatsu Materia series. Can you confirm if a 17" wheel will fit a daihatsu materia?? If so what tyre size will fit too. I have seen them on a modified car, but wheel arches may have been widened. Yes you can fit 7x17 and 7.5x17 with offsets of ET 42 to 35. Hi my name is Matthew, I have 17" alloys on my Materia, they were from the extras list, the tyres are 205/45/17 and they fit fine.